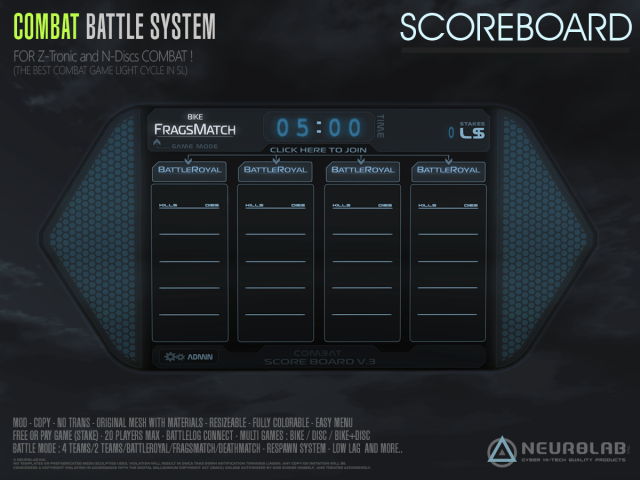 NEUROLAB is proud to present you the new ScoreBoard V3 for play with our Z-Tronic – BIKE “Combat Version” and N-Disc Combat to ours BATTLE ARENAS. • NEW DESIGN +100% MESH + MATERIALS. • 3 GAMES STYLE: BIKE, DISC, BIKE+DISC. • 2 GAMES MODE: FRAGSMATCH AND DEATHMATCH MODE. • 3 PLAYERS MODE: 4 TEAMS, 2 TEAMS, BATTLEROYAL. • FREE OR PAY GAME. – First player to click the ScoreBoard becomes the HOST of the party (name in blue). They can control all settings for the ScoreBoard. – The HOST set the minimum price to play, but players can add more. – Price to play: 9999L$ Maximum. (The Winner(s) received all L$ in game). – FREE GAME: for free play, not paying the ScoreBoard when joining. – BIKE+DISC: For play with Z-Tronic™ – BIKE “Combat Version” + N-Disc Combat System. 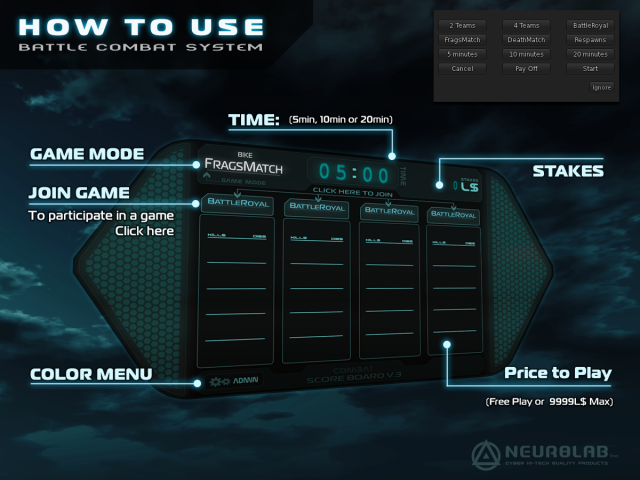 – DISC: For play with N-Disc Combat System only. – FRAGSMATCH: Best frag score win the party. – DEATHMATCH: Survival mode, last player in game win the party! – 2 TEAMS: 10 players VS 10 players. – 4 TEAMS: 5 players per Team x4. – BATTLEROYAL: every player for himself. (20 players maximum). ■ TIME: You can change the time for party (5min, 10min or 20min). ■ PAY Off: Refund pay to players. the option “Reset” if he doesn’t want to wait two minutes. you can add some respawn points to the board . – Clear Links : remove all links from all respawn points. – WEAR Z-Tronic Bike HUD DRIVING or HUD Combat Disc for manage Board. – Choose your color laser on the HUD before the START. once the party is ongoing, you can not change it. – After the end of the party, the board will reset after 2min. – If the host leaves game or sim, the board reset after 5min. – For pay : Right click to ScoreBoard and pay. – To participate in a game, click on the TEAM Number to choose a team or “Battleroyal” text. – In BattleRoyal mode, click on any of the columns to join. – NEW DESIGN +100% MESH + MATERIALS. – Respawns for Disc, Disc+Bike and Bike added. – Compatible with N-Disc Combat System! MODE DISC & Respawn added!